I have a fascination with the anatomies of objects. All things old and new are a composite of parts and those parts have names which are occasionally linked to an interesting history. Likewise, i also have a fascination with the wording of objects, which in most parts always comes down to Latin, fascinating (who are you lee, Spock!) fascinating. We sell quite a few candelabras which are mostly silver plate or brass, and when polished up they shine magnificently, there is nothing quite as aesthetically pleasing as a lit four arm candelabra casting its warm glow across a room, its flickering flames creating all sorts of dancing shadows and shapes. The candelabra fascinatingly (stop it!) 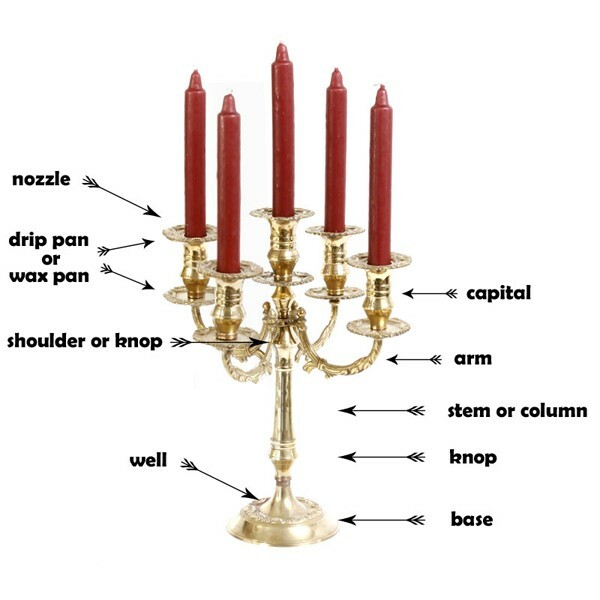 can also be called a candelabrum. Candleabrum was once the correct word to use and translates in Latin as candle tree, in old English the word candeltreow was used, and in old French chaundelabre. Candelabra was somewhere at sometime devised from all of these words and since the early part of the 20th century become the more popular term and has stuck all the way here to the present. Now without going into too much detail candelabras have been around for quite a while, but my definitive research (ha) never come up with a specific date other then somewhere around the 14th and 15th century where they became popular and a modern fixture in ye old dwellings and mostly the dwellings of the rich, where a candelabra became not only a way to light your home but also a way to display your wealth. There are different types of candelabras, the more common ones being candelabras with 2 arms and a central candle holder which will accommodate 3 candles in total, and a 4 arm candelabra with a central candle holder which will accommodate 5 candles. Likewise, you will also find just 2 arm and 4 arm candelabras without the central candle holder. Occasionally you might find candelabras with caps placed on top of their central candle holder, which in turn can be used as a candle snuffer. We once came across a silver plated candelabra with rotational or pivotal arms which were designed to be lit more easily by enabling you to turn the candle arms from the shoulder instead of having to move the whole candelabra from its base. Another forte of the candelabra is that some have detachable arms so they can be used as candlesticks, and is an attribute useful for cleaning purposes. When it comes to styles of candelabra the most classical styles are Baroque, Rococo and Georgian, but you will find plenty of modern and shabby chic styles too and can be made from solid Gold, Silver or Brass but they are usually electroplated in these metals. They are also made from other metal alloys and can even come with different types of bases and columns made from marble, wood and lucite. The Well on some candelabra is on the base and like the wax pan is for catching the melted wax. The Capital sometimes gets referred to as the sconce, however, a sconce under the English definition is a wall mounted candelabra or light. So there it is, I think i have possibly fulfilled my fascination with the anatomy of a Candelabra and hopefully yours too. And if you’re looking for a decorative candelabrum, candlestick, chamberstick or even a candle pillar for your home, then check out our Candle Holder category to see what we have in stock.